A significant proportion of mammalian genomes corresponds to genes that transcribe long non-coding RNAs (lncRNAs). 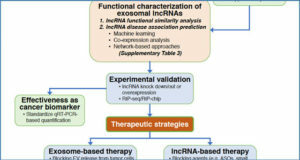 Throughout the last decade, the number of studies concerning the roles played by lncRNAs in different biological processes has increased considerably. This intense interest in lncRNAs has produced a major shift in our understanding of gene and genome regulation and structure. 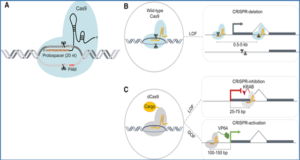 It became apparent that lncRNAs regulate gene expression through several mechanisms. 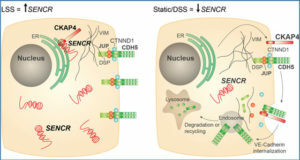 These RNAs function as transcriptional or post-transcriptional regulators through binding to histone-modifying complexes, to DNA, to transcription factors and other DNA binding proteins, to RNA polymerase II, to mRNA, or through the modulation of microRNA or enzyme function. 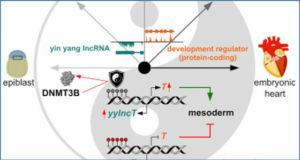 Often, the lncRNA transcription itself rather than the lncRNA product appears to be regulatory. 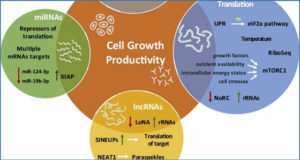 Researchers from the Federal University of Paraná highlight studies identifying lncRNAs in the homeostasis of various cell and tissue types or demonstrating their effects in the expression of protein-coding or other non-coding RNA genes. (A) Nomenclature of lncRNA genes (gold ellipses), according to their genomic location relative to the nearest coding gene (black ellipses) and/or to exons of coding genes (black rectangles). 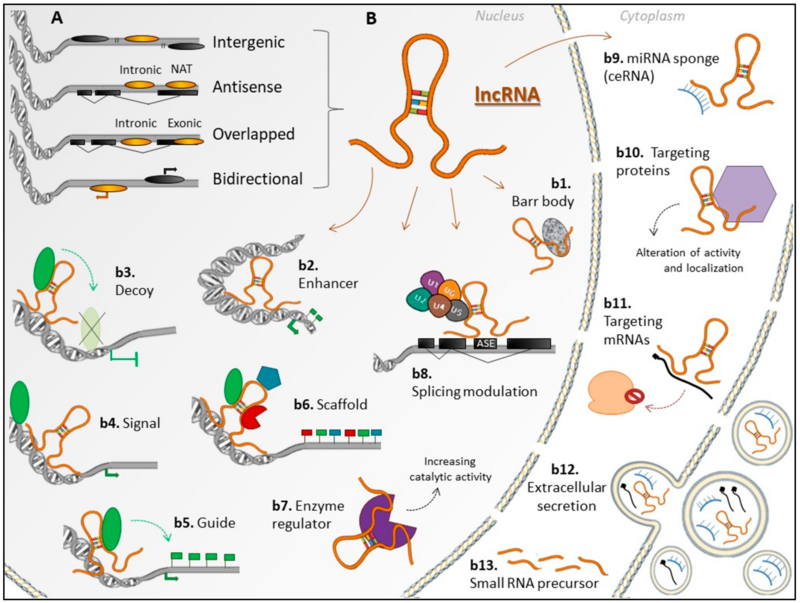 (B) lncRNAs regulatory mechanisms: (b1) lncRNA Xist, as a component of Barr body in females; (b2) acting as enhancers, inducing transcription in cis or in trans; (b3) a decoy to regulatory proteins, such as transcription factors and chromatin modifiers, blocking their binding to DNA; (b4) as molecular signals, activating or silencing gene expression through signaling to regulatory pathways; (b5) Guiding proteins (in general, chromatin modifiers) to specific target sites; (b6) as scaffolds, binding different proteins and forming ribonucleoprotein (RNP) complexes, which also affect gene expression; (b7) interacting with enzymes, such as kinases, regulating/enhancing their catalytic activity and altering their signalization; (b8) modulating alternative splicing of primary transcripts; (b9) as competing endogenous RNA (ceRNA), serving as a sponge for microRNAs (miRNAs), blocking their effect; (b10) targeting proteins, forming molecular complexes which can block or induce functional effects, or even alter their location in the cell; (b11) targeting messenger RNAs (mRNAs), inhibiting their translation in ribosomes. 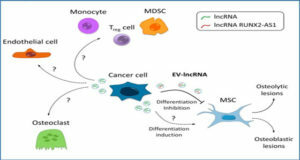 In addition, lncRNAs can be (b12) transferred to other cells by extracellular vesicles (EVs), where they can produce effects; (b13) precursors of miRNAs and other regulatory small RNA. An lncRNA can act by multiple regulatory mechanisms, in both the nucleus and/or in the cytoplasm. The b12 itself is not exactly a regulatory feature, however, the release of these functional lncRNAs through EVs is a way of regulating genes, RNAs, or proteins in other tissues. ASE—alternatively spliced exon.